Cook tapioca pearls as directed on package. In blender, place Tea Mixture ingredients. Cover; blend on high speed until smooth. Using slotted spoon, place tapioca pearls in tall glass. Top with tea mixture. Serve with extra-wide straw so tapioca pearls can be sipped through. If you do not like adding tea to your beverage, add additional juice or ice. Either way, this refreshing drink is sure to please! Traditionally, bubble tea uses large tapioca pearls; use whatever you can find--the recipe is delicious with any size tapioca. If no package directions are given for tapioca pearls, make as follows: In 2-quart saucepan, heat 2 cups water to boiling. Add tapioca; cook about 15 minutes or until pearls are tender but still chewy. Meanwhile, in 1-quart saucepan, heat 1/2 cup water and 1/2 cup sugar over low heat, stirring until sugar is dissolved. Set aside to cool, then add to cooked tapioca pearls, allowing them to absorb the sweetness. 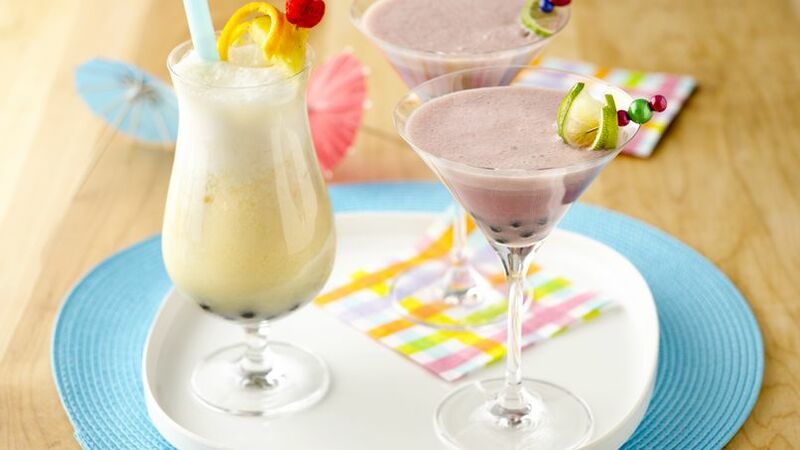 Make your own bubble tea at home using Yoplait® Light yogurt!